I saw John Carter last night at an advance screening in 3-D. There was a drawing at work, I tossed my name into the ring, and I came away with a pass. As recently as three weeks ago I was ambivalent about the film. The trailers weren’t exciting me, and Disney was doing a terrible job marketing the film. Hell, Disney was embarassed about the film’s title — they couldn’t call it, as Edgar Rice Burroughs had done, A Princess of Mars because “princess” carries with it certain connotations in a Disney world, and they dropped “of Mars” from the title because Mars Needs Moms crashed and burned like a giant crashing, burning thing — and if Disney was embarassed about the movie, that couldn’t possibly be good. Then I saw what Sky Captain and the World of Tomorrow‘s Kerry Conran had in mind for his A Princess of Mars movie, and I thought his demo reel looked better than anything I’d seen in a John Carter trailer. Things were not looking good for John Carter. And then something happened, something the Ring did not expect. I started to get excited. Disney released more videos online, and they were more epic than the trailers, which had some strange conceptual thing going on that didn’t showcase the visuals of Barsoom very well or convey a sense of the story. There was no hook to the trailers; if someone watching had no idea of the source material, they wouldn’t have had any idea what John Carter was going to be. Even a simple “The epic adventure from the creator of Tarzan and the director of WALL-E a century in the making!” would have sufficed. But then Disney released a video of Carter fighting two white apes, there was another production video that focused on Dejah Thoris, there was a great review at the Guardian, io9 interviewed screenwriter Michael Chabon, and I began to feel like John Carter got it, that it was going to be the Barsoom movie I never knew I wanted. John Carter is awesome and bloody fantastic. The film does start slowly, its story hews only loosely to the major plot points of A Princess of Mars and makes some reasonable extrapolations from it, and it has a nice balance of action, humor, and sensawunder. This isn’t the way I imagined Barsoom when I read the books when I was much younger, but it’s a reasonable facsimile. If you loved the books, it’s wonderful. If you’ve never read the books, I don’t see why that would be a problem. It’s definitely a better film than the trailers made it out to be. It’s an effective piece of filmmaking. There’s not a dodgy performance in the film, the Tharks are realized much better on film than I thought they would be, there’s a decent attempt at worldbuilding Barsoom so it feels like a real place, and the characters, especially Carter and Dejah Thoris, are invested with a psychological weight that Burroughs never gave them. It hits the major notes from A Princess of Mars, there’s a Tars Tarkas line from The Gods of Mars that gets quoted twice, it’s distilled the essence of Princess down into something that works for a modern audience as a two-hour film. Take the Tharks, for instance. These six-limbed aliens look very real. Each Thark is individualized, they have individual personalities. There’s something Tars Tarkas does with his four arms that it never occurred to me a Thark would do, but when he did it I was like, “Well, damn, of course a Thark could and would do that!” They do occasionally move awkwardly, but I think that’s a deliberate design choice rather than a limitation of technology because the banths and Woola the calot, which are also CGI creations, move far more naturally. John Carter‘s Tharks aren’t really Burroughs’ Tharks, though; these Tharks couldn’t run like a centaur, for instance, and they’re not as tall. That said, they are very effective on screen. Much has been made of the fact that this is PIXAR director Andrew Stanton’s first foray into live-action directing, but you’d never tell that from watching. He has easy faculty with the camera, he gets good performances from his live and CGI characters, and he knows how to intercut a scene for emotional impact. There’s a scene that comes about 1:15 into the film that is genuinely moving as Andrew Stanton intercuts between the Barsoom present and Carter’s Civil War past. Yes, it’s a manipulative kind of moving, but the fact that the emotional manipulation works makes it effective. There are things that I missed from Princess, particularly a piece of Tars Tarkas dialogue that, I think, is worth the price of the book, but I’m okay with that. There’s not as much Tars Tarkas in the film as I’d have liked; the major Thark character in the film is Sola, the Thark that takes in John Carter and cares for him. I would have loved this film at eight, which is about when I saw Star Wars for the first time. I’m not ready to say I loved this, but I will say that I really liked it and I won’t be ashamed to buy it on DVD on day one. On the drive home I compared it mentally to Jackson’s The Lord of the Rings trilogy and Lucas’ Star Wars prequels. It’s not as serious as Jackson and it’s more fun than Lucas. John Carter feels epic, yet it also has an intimacy to it. I would venture that this is what the Narnia movies wanted to be; they’re both working from problematic source material (the Barsoom and the Narnia books are full of incident but not necessarily anything resembling a sensible plot), their writers had to construct a plot that kept the flavor and the spirit if not the detail, and John Carter, I think, pulls it off a little bit better because it does a better job at rationalizing and modernizing its story. That said, John Carter isn’t perfect. There’s some dodgy effects work (such as in the scene where Carter, after he’s arrived on Barsoom, has no idea how to move in the lower gravity), some of the physics doesn’t make sense, Carter’s accent is all wrong for an 1860s Virginian, Mars looks too much like the American southwest, it’s not at all clear what the villains’ goals were (or why they were seeking to achieve those ambiguous goals in the way that they were), that sort of thing. The one thing I won’t criticize the film for is its title, though. Yes, it’s gone in for abuse in fandom, but in the context of the film it can only be John Carter. 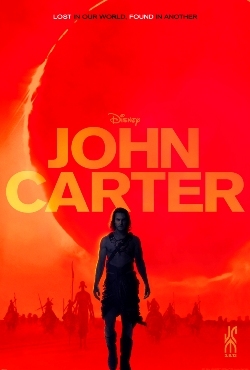 The film is driven by Carter’s desire to go home so he can return to his “cave of gold” (not really a spoiler, since the same arc is in the book), so “John Carter of Mars” would not be true until he finds himself and his place in the universe. Believe me, I would have wanted nothing more than to see the words “of Mars” in the title, but after seeing the film last night I know that they don’t apply. In short, this is A Princess of Mars distilled down to a two hour movie that will appeal to a modern day audience. Edgar Rice Burroughs’ planetary romance from 1912 has been made relevant for 2012. I enjoyed it thoroughly — it’s funny, it’s moving, it’s exciting, and I want to see more — and I’m thinking of going to see it again this weekend, this time in 2-D.